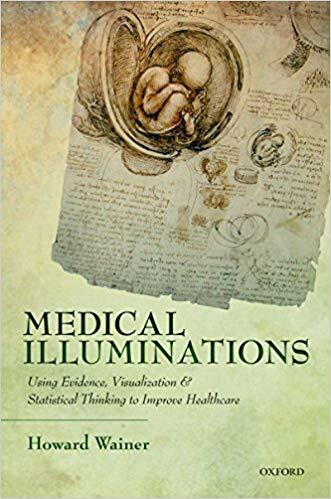 Howard Wainer, "Medical Illuminations: Using Evidence, Visualization and Statistical Thinking to Improve Healthcare"
Is it sensible to screen for breast or prostate cancer? Should the locations of cancer clusters be made available to the general public? When a doctor wants to perform major surgery and there's no chance for a second opinion, do you agree? The answers to these questions are not as black and white as they may first appear. 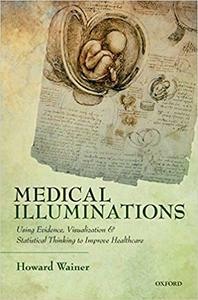 Medical Illuminations presents thirteen contemporary medical topics, from the diminishing value of mammograms to how to decide if a hip needs to be replaced, to understanding cancer maps. In each case it illustrates how modern tools of statistical thinking and statistical graphics can illuminate our understanding. The goals are to solve some vexing problems that seem perplexing, and to make both the problems and their solutions clear to a non-technical audience. The aim is to ignite in the reader an understanding of statistical thinking, which, though subtle, can be learned without going through arcane mathematics. And, moreover, that learning about how to think in this way provides a huge payoff in the deeper understanding of our complex world.